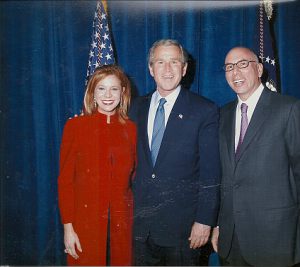 With deep gratitude, President George W. Bush, accepted his full-length bust and profile silhouette from distinguished silhouette master, Cindi Harwood Rose. He hand-wrote a thank-you expressing his admiration of her talent and craftsmanship, and attention to detail. Cindi is a distinguished speaker for museums, art galleries, Daughters of the Revolution, children’s museums, and historic societies on the importance of capturing personality, clothing, and profile, to record history. The profile portrait has come and gone in history, yet the silhouette has remained timeless. The Egyptians and Greeks insisted on accuracy, and no other contemporary artist as C. Harwood Rose, makes accurate silhouettes, the other artists of the era, sans of few, do amusement-park styles, which mimic the 1800’s, or do silhouette without details, and often not in proportion, such as the ones seen in many stores that look photo shopped. Pisanello medals and Pollaiuola portraits expressed the ideals of the Italian Renaissance, while the conscious programmatic profile became the rage in David’s paintings. In 1806 Goethe felt silhouettes linked two “irrevocably sundered ages.” What makes Cindi Rose’s silhouettes worthy of investment (especially if you get one on her historic antique paper) is that she goes into the human psychology of her subject, and captures their profile. Cindi Harwood Rose, has done many presidents of countries, and royalty in person, once being courted herself by a royal, that The London Times captured, but Rose (then Harwood) is silent about the many that tried to win her heart. She is continually asked to do silhouettes for weddings such as Jennifer Aniston, yet her booked schedule often has her recommend another artist, one that can’t do the details she can do, or the groupings, the type that make all look like they came from a furniture store, that sells reproductions and generic silhouettes, minimalizing the art. Naïve, she is a natural in society, and is part of it, with her many volunteerism, and her elegant, style and dress. But her passion is to preserve this art. In 1982, she was flown to London by the Europe, and was on BBC TV doing her remarkable artwork of Peter Duncan and staff on the popular “Blue Peter” show. The limo took her by the Queen Mother, and let her profile her, from a room across the room. She was printed in their historical books for sale in their most popular Harrods’s department store, and even slated to be married to a royal, just by her posture, and etiquette. It may have helped that she had an English last name, Harwood. Rose, who can be viewed on silhouettesbycindi.com and watched on YouTube, or even joined at SilhoeuttesbyCindi Facebook is available for historic, prestigious events such as The Smithsonian, elaborate weddings of all cultures, educational fund-raisers, and celebrity Hollywood “it list” weddings and gifting suites. Her signature has become valuable, historic silhouette artist expert, Peggy McClard, acclaims on her world-recognized gallery and collection of silhouettes, available to view and purchase, on line, and by appointment. Rose’s work will be worth thousands, her work is important and delves into persona. 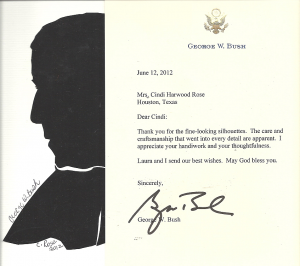 President Bush, loved the silhouette Cindi Rose did of his mother, and thanked her for her handiwork and craftsmanship with her attention to detail. His letter can be read above. 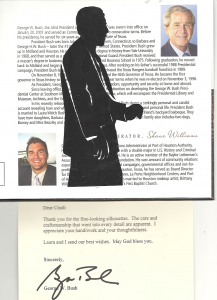 Cindi Harwood Rose, President George W. Bush, silhouette artist. Bookmark.